﻿ EDR - Built on Responsive Customer Relationships. Built on Responsive Customer Relationships. EDR prides itself in molding your company’s broad range of utility and production gas data into fully understandable, workable solutions for your Accounting, Procurement, EHS&S and Facility Managers needs worldwide. The rough seas of understanding your Energy Data will be calmed. Our complete program is Data Driven and it is the cornerstone, Black and White we deal in reality and assist you in truly attaining your goals. Energy consumption and costs are largely impacted by the weather and production trends. By reviewing past weather patterns and meteorological data and discussing your past and future production trends, you can establish a benchmark for your organization's energy needs month-to-month. EDR strives to bring value by augmenting the strengths our partners have in-house and applying tailored resources to meet their needs. All of our relationships are built on the knowledge of our partner’s utility data information. Formatted in a secure, easy to access, web-based program that can be interfaced with your internal accounting and environmental systems for compliance reporting worldwide. Our current client base consists of a wide range of small privately held companies and large multinational corporations. The EDR team has extensive experience in Commercial, Industrial, Healthcare, Education and Municipal partnerships from local and International viewpoints. If you have questions about EDR, please email us. Our team of experts bring solid industry experience in numerous fields. Energy Data Resources [EDR] strives to bring value to our clients by augmenting their strengths with our customizable products. From small privately held companies to large multi national corporations, our client base knows that EDR is built on responsive customer relationships. EDR offers you more than just data management. Our team of worldwide employees work closely with each one of our clients to understand their organization’s energy needs and objectives. By building these strong relationships, we work harmoniously with your staff allowing your company to exceed its goals in a proven, well documented way. EDR can help provide sustainability resources, energy compliance, conservation project planning and more. • Organize and manage your energy portfolio. EDR provides all of the available data to you. • Develop and implement a National and/or International Energy Management and Procurement Plan. 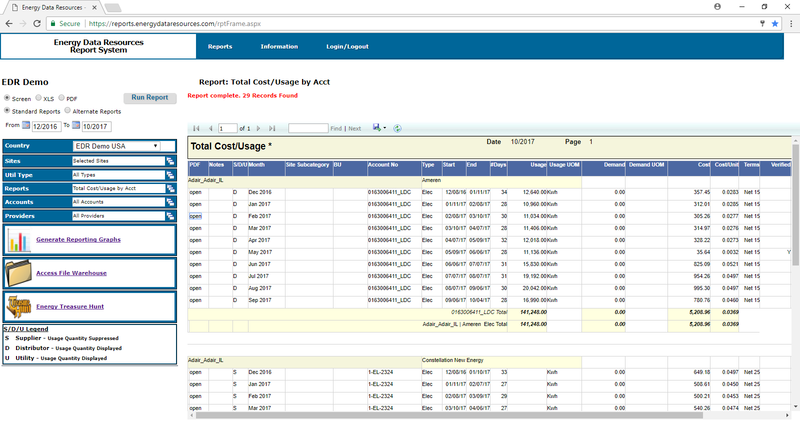 • Manage your worldwide GHG and EHS&S energy documentation needs with customized interfaces. • Assist in building or managing an Energy Treasure Hunt process for your facilities worldwide. • Benchmark your infrastructure to identify areas that would benefit via Energy Conservation Measures (ECM). • Assist in the engineering and project management of facility improvements. • Provide continued commissioning of your facilities, as you warrant it. Most importantly, EDR offers customization and client control. You decide the areas that require support, the products you need, and the level of management necessary to meet your objectives. As you make these decisions, EDR is available to answer questions and provide guidance. Contact us to learn more about all of EDR’s products, services and areas of expertise. We look forward to listening to you and learning your goals. With that knowledge, we can jointly decide the best tailored program to bring value to you and your organization. EDR’s Energy Reporting System is a secure, easy to access web-based program that enables compliance reporting worldwide. It can be interfaced with your internal accounting and environmental systems. We continue to update the Energy Data Management System to meet individual needs of our customers because we don’t believe in “one size fits all” solution. This means that it goes beyond just helping you understand energy data or assisting in the development of your corporate Energy Procurement Plan. It brings equal value to your accounting team, plant management and EHS&S to name a few. All of our files can be downloaded directly to your general ledger, eradicating the need for manual data entry. Plus, each expense can be proportioned per your accounting teams’ GL coding by site, by building, and by meter automatically via this download. This system is also a valuable tool for your accounting teams when doing monthly accruals since they will have accurate historical data at their fingertips that can be sorted by month over month, quarter over quarter or any number of other combinations. If you’d like to know more about how other clients access their data and how it brings value to their companies, please contact us. We would be happy to share with you and help you assess whether EDR’s unique Energy Data Management System is a good fit for your organization. EDR’s team of skilled professionals brings industry experience in numerous energy related fields. Whether you need an expert on natural gas, electricity, water/sewer, waste management or a number of other areas, EDR has the knowledge to help you meet your goals and we will do this in an open and value based approach. The EDR team averages over 27 years of Energy and/or Accounting experience and we bring all of that expertise to your portfolio. • Data management personnel with extensive accounting backgrounds so they understand your organization’s demands. • A procurement team specializing in natural gas, propane, fuel oils, electricity, backup energy systems, water, sewer, and a wide area of waste issues. • The ability to make knowledgable infrastructure improvements. This understanding is coupled with the willingness and skills to assist your in-house staff or completely manage the most complex projects. • A full understanding of the worldwide rules for compliance and monthly documentation for all of the areas you will need for reporting. In short, EDR is a company with proven experience and the knowledge to help you and your company reach your energy goals. If you would like to learn more about EDR’s areas of expertise, please select a specific area of expertise from the drop-down menu or click on a link below. You can also contact us, as we would be happy to share more detailed information. EDR’s team of procurement specialist will assist you in developing a progressive forward view of utilities worldwide and then assist you in implementing a plan that will work to your advantage. With knowledge of the relationships between the different types of utilities (such as fuel oil, electricity, propane, wind, natural gas, waste, recycle water, sewer and more), we can scout ways to capitalize on energy structures that will bring value to your organization. For example, EDR knows the mechanics of molding your energy portfolio to make optimum use of rate scales and how best to bundle your loads when available structures allow. These strengths are just a few of the key attributes of our energy analysis. Our experts are here to augment your strengths. We can provide data and background information and allow you to handle the procurement process internally or we can manage the process for you all the way through the negotiations and contract review. Our RFP/Letting process is Open Book we will always lay out all of the options we have explored for you. We will also explain the positives and negatives for each strategy so you can make an informed decision. All costs for this service is fully exposed and never hidden in ‘broker fees’. Understanding the nuisances of the ever changing telecommunications industry is something we take great pride in at EDR. We have hired some of the industry’s best to provide you great service from auditing your invoices to giving expert advice on how to create the best corporate plan for your organization. The telecom field is full of inspired technology and what may seem to be fancy features so deciding what plan will best fit your organization can be complicated. At EDR, we can help you decide on the type of services you need while helping you prevent over spending on unused features, auditing these plans is critical and your EDR team is the best in the industry. The plans can be location specific or span the globe. Either way, we will work closely with your team to understand your needs and build a system that meets those requirements without locking you out of future advantages. Managing and Procuring all of the varying types of your waste and recycling materials is far more involved than ever before. Working with a plan that is driven from a starting point of the landfill we build programs that will succeed. Fortunately, EDR excels at educating your team on ways to manage this combined stream to your advantage site by site. Our education tools are available for implementation at your sites worldwide. Our current partners have benefited from EDR’s assistance in helping them understand the types of programs that are available in each location and how those programs will impact their corporate footprint and fiscal picture. Because waste management should address your organization’s specific requirements, we encourage you to contact us so we can explain how EDR will tailor a program to best handle all of your waste needs working from your local landfill backwards to your sites collection habits. We will work closely with you and your sites to build a Data picture of each of your facilities. This way, as procurement, energy management, waste stream assessments and many other types of assistance is needed, we can benchmark your sites against each other. You’ll know that EDR has already grouped similar facilities together. These groups go beyond regions to include building styles, sizes and the number of staff. Managing the data this way is critical for accurate comparisons and making informed decisions. EDR’s team of skilled professionals brings industry experience in numerous energy related fields. Whether you need an expert on natural gas, electricity, water/sewer, waste management or a number of other areas, EDR has the knowledge to help you meet your goals driven by managing your Data for your gain. We will do this in an open, reality based approach to maximize your value. EDR specializes in custom solutions for our clients. We don’t take a one size fits all approach. We adapt and create services to fit your needs at any stage of business. If you’re curious about implementing a new service, email us! If you would like a live demo of our Data Reporting System please send us an email and we will contact you.